In my first two plays „How much is pate?“(Atelje 212, Belgrade, 2012, dir:Snežana Trišić) and ,,Scratching or How my Grandmother Killed Herslef“(Bosnian National Theater, Zenica, 2012, dir: Selma Spahić), I tackled the topic of the borders very literary – in terms of content of the plays. In the first one, a butcher, builds a Buddhist temple in the middle of Bosnian war and village, for his beloved and gone one-time lover – internationally acclaimed top model, now living in Japan and UK. In the second one, a girl Maja throws a special farewell party to herself one day before she leaves Bosnia to go to Germany with her dad. So immigration (and thus crossing the borders) as a phenomena was a vehicle that started and moved the whole plot of the two texts. Later on, in my work, the question of the borders turned into a formal one – how to push my own borders as an author as well as some of the intrinsic borders of the media, of the apparatus of the theater and the theater text? So, in my third and fourth texts ,,We are the Ones Our Parents Warned Us About “ (Bosnian National Theater, Zenica, 2016, dir: Mirjana Karanović) and ,,But the city has protected me” (National Theater Užice, 2018, dir: Bojan Đorđev), I was experimenting with characters, theater time and space, in attempt to destabilize them. Finally, in my last two texts, ,,All adventurous women do”(Deutsches Theater, Berlin 2018, dir: Salmome Dastmalchi) and ,,Regime of Love”(Atelje 212, Belgrade, 2018, dir: Bojan Đorđev) I have tried to combine both approaches – and to question the borders of both medium/text itself and its content. I feel that my artistic practice could only be fully substantiated by constant moving, by constant changing of the very understanding of the notion of border, or as Pascal Gielen stated: ,,The artist is international, or non-existing“. The same goes for the art – if it doesn’t insist on crossing the borders it doesn’t exist. Tanja Šljivar was born in Banjaluka, SFR Yugoslavia in 1988. She holds both BA and MA degree in dramaturgy at Faculty of drama arts in Belgrade. She wrote full length plays How much is Pate?, Scratching or How my grandmother killed herself, We are the ones our parents warned us about, But the city has protected me, All adventurous women do and short play Stillborn, which were published, publicly read and produced in professional theaters in Bosnia and Herzegovina, Croatia, Serbia, Albania, Spain, Poland, Austria, Germany. She also writes short stories, radio plays, screenplays for short films and theater-theory texts. She won several awards for her playwriting, most recently the prestigious Sterija award for the best contemporary play in Serbia, MESS market co-production award for All adveturous women do in Bosnia, as well as the nomination for the Retzhoferdramapreis 2017 for the same play, in Austria. Her plays have been translated into some 10 languages. 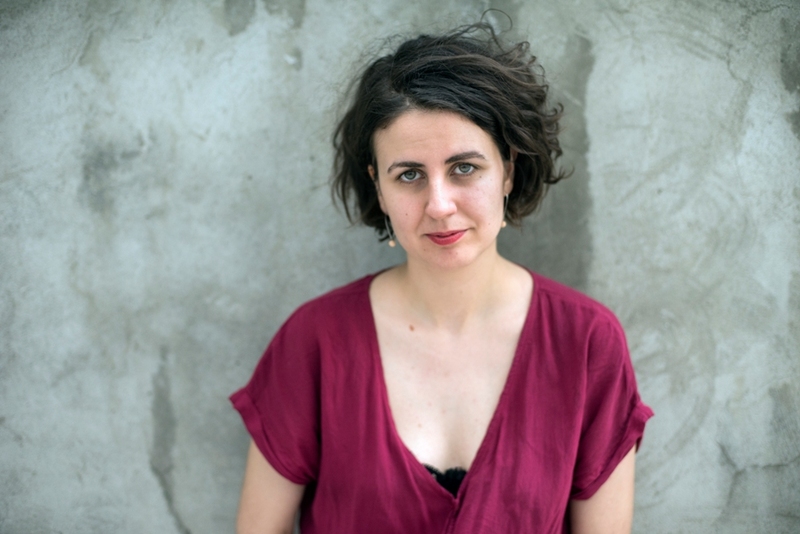 She has been a guest of writing residencies IHAG in Graz, Austria, Museums Quartier 21 in Vienna, Austria, and Prishtina has no river in Prishtina, Kosovo. She is currently attending MA course in Applied theater science in Giessen, Germany. Scratching or How my grandmother killed herself is coming of (early) age full length play in which five 10-year old kids prepare for the school performance in the year 2000 in Banjaluka, Bosnia and Herzegovina. Games, teasing and violence are gradually discovering collective, family and personal traumas, losses, failures, damages and insecurities of children stuck in the school system of the post-war Bosnian society. In Bosnia, Maja uses the occasion of the preparation for the school performance, which is to be held due to the opening of a special entrance into the school for a disabled classmate, and turns it into her own violent farewell party. Maja is leaving tomorrow to Frankfurt and wants to leave a memory of herself to the others. In Germany, she sells her memories documented on a mini DV tape to a new schoolmate, also an immigrant girl from Bosnia, who teaches her new, German customs and words.